The history of Finnish Youth for Nuclear Energy starts from fall 1994, when Finnish people voted to join the European Union. The previous year the Parliament had turned down the then application for constructing a fifth nuclear power plant. A small number of actives in youth politics and their close friends considered it necessary to establish a civic organisation, which gathers young people to support the economic and environmental benefits of nuclear power. Piia-Noora Kauppi, who is a Member of European Parliament at present, was one of the actives. Finnish Youth for Nuclear Energy has been registered in National Patent and Register Board November 28th 1994. The three founder members are Oula Järvinen, Jussi Kekkonen and Antti Mäkinen. The following year the Finnish name of the association was changed to punchier and shorter version. At the moment the Finnish name of the association is Ydinenergianuoret ry (YEN). The abbreviation would probably be hard to register on the internet, as the Central Bank of Japan would hardly be fond of it. The 10-year anniversary of the association was celebrated last year in Espoo by the first nuclear reactor of Finland, Triga. Finnish Youth for Nuclear Energy had a central role in sparking off the civic debate, when the State of Council and Finnish parliament dealt with TVO:s application for a fifth nuclear power plant. The application was left November 15th 2000 and the positive statement was given May 24th 2002. According to some surveys, the issue is the second of most debated public issues in newspaper columns and letters to the editor in the history of Finland. The EU-membership debate holds the record. The association has some 500 members. Largest part of them follows actions via mailing list but have at some point participated excursions to either Loviisa power plant or Olkiluoto power plant. Vice Chairperson of the association, Kari Kuusisto, has attended almost all the excursions. 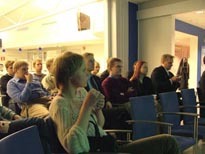 Finnish Youth for Nuclear Energy is an environmental association that emphasizes the benefits of nuclear power concerning its whole life-span. Nuclear power is needed especially in order to decrease carbon dioxide emissions of energy production. Emissions can be decreased cost-effectively in the future as well by constructing a sixth nuclear reactor. According to predictions, even that will not be enough to replace present fossil fuel plants, which will come to the end of their lives by 2020. By fast actions the sixth nuclear power plant would be in use by 2017, but before that the option to construct a seventh plant would probably have to be examined as well. Naturally everything depends on Finlands role in international economy. In case part of our process industry is continually transferred to China, increasing demand of electricity will surely cease but the social costs of that sort of development are terrifying. In accordance with its rules Finnish Youth for Nuclear Energy will strive to change society to be ecologically, economically and socially more sustainable. In addition the association will strive to improve equal treatment and acceptability of different forms of energy in society. Finnish Youth for Nuclear Power acts for nuclear non-proliferation treaty and contributes to nuclear disarmament by supporting converting weapon material into energy productions use. We also support responsible policies in final disposal or reprocessing of nuclear fuel. Is nuclear energy really dangerous?